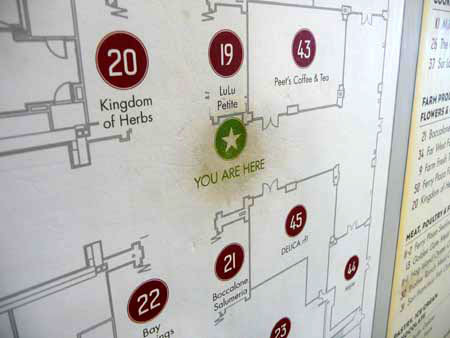 It’s interesting to consider why the ‘you are here’ marks are so worn in the first place. Obviously, people point at them with their fingers, but why do they do that. My guess (from past observations) would be that it stems from the situation where two or more people are looking at the map, trying to make sense of it. The first thing they do is scan for ‘you are here’. The first person who spots it then puts their index finger on it to point it out to their friends. 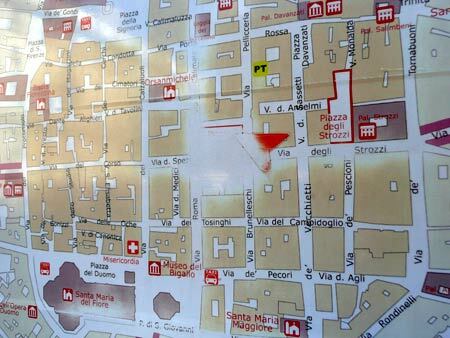 So perhaps it’s possible to infer from the use-mark how usable the design of the ‘you are here’ mark is. ie the more its worn out, the harder it is to initially spot, leading to people feeling a greater urge to physically point it out to the person they’re with. You’d have to control for factors such as the length of time the map has been in place, and the estimated number of people using it, but this would be an interesting theory to test! I’m reminded of keypad locks whose designers may not have foreseen a compromise in security through ‘digital’ wear and tear on the keypad – especially as many of them don’t rely upon digit order (a vital detail they prefer not to inform the purchasers/users of). I’d also make the observation that in betraying use, wear, or rather a lack of wear, can thus betray that which is not useful. I think “putting my finger on it” hooks up my left brain for the map “reading” exercise. Great post, Dan. I see this as a data point on the greater theme that there is nothing unique about the Internet or indeed the digital world. It’s just that material hasn’t caught up. Deep packet inspection can be used to sniff packets for copyright violations, just as MPAA-trained dogs can sniff packages for the tell-tale sign of burned CDs. Clicks and beacons can tell you where a person goes on the Internet; cell phone trackers in malls can do the same with real customers. I’ve noticed this too. In fact I took a picture last year in San Antonio of a map with a hole right down to the metal underneath. No paths but there was a smaller hole nearby. I forget what was there but it must have been almost as important as where we were standing. Dunno if it’s relevant, but wear can also manifest through exposure to more than mere digits. The sun can wear things out, e.g. products in a shop window that remain unsold may remain unsold longer when people figure there must be a good reason why the packaging has become sun-bleached. So, even customers’ selection from a shop window can inform other potential users as to what is hot and what is not. Perhaps one could adjust the contrast of menu options based on popularity? Or even create finger wear ‘halos’. Perhaps as with Star Wars, we’ll soon see the introduction of grime into GUIs to provide the subtle cues as to what’s been exposed to use and what’s brand new? Perhaps grime and use lends legitimacy? If you haven’t been exposed to the elements, been exposed to the grubby hands and fingers of the masses, then you haven’t been tried and tested. Akin to the introduction of scratches and crackle into music on CD? Pre-worn jeans? Pre-loved teddy bears? Distressed furniture? Fake verdigris? I’ve done the digital inverse. I once infected the site wide emacs init file to record counts of what commands we were all using. A weekly report showed the counts and people would notice in the long tail commands they had never tried. I love the idea of designing to enable wear marks. I’ve seen that done as an investigative method, laying down a layer to dust to and later seeing what’s been disturbed. That’s a fun insight: using the techniques of faux antiquing as a control device. Could a shop keeper do something to his entry that signaled to random consumers that everybody else steps into his shop? Could you run with the idea of those faux page corners on web pages to creating affordances that signal everybody uses me. I think there’s lessons to be drawn from other things that get touched to the point of being worn down, where there’s a different type of persuasion or encouragement to touch, rather than a natural functional expression of a task. I vaguely remember the BBC site experimenting with “wear” on their home page some years ago… Not sure whether it ever made it properly live but the idea was quite interesting. Links aged (lightened) with time unless someone clicked and reinforced them. The result was a fading of the untrodden paths. Kinda like ants and pheromones trails.